If you’ve ever reset an iPhone to factory default settings or restored a device to set it up as new, you may have run into this “Activation Error” message when going to set up the iPhone again. The accompanying message is somewhat vague and not particularly helpful, saying “Activation request could not be completed. If the problem persists, please contact customer care.” If you happen to be near an Apple Store then sure you can contact Customer Support or stop in to the Genius Bar to get past the Activation Error screen, but that’s not always practical. Fortunately, there are at least two other ways to get past the activation alert message and continue setting up the iPhone as usual. Before anything else, make sure you’re connected to a functioning wi-fi network that is able to connect to the broader internet. Sometimes a very restrictive router can be the culprit and may block the iPhone from attempting to reach Apple’s activation servers, so simply joining a functioning network does the trick, allowing the iPhone to communicate with the outside world and skipping the screen. I ran into this recently when clearing out an unlocked iPhone for gifting to a friend, and discovered that after about five attempts of selecting “Start Over” it finally worked and the Activation Error screen was bypassed. Whatever is going on behind the scenes is obviously somewhat busy and clearly a reliable service, so just have some patience and try a handful of times, you’ll almost certainly get past the screen eventually. Or if you’re impatient and you have a SIM card handy, jump to option 2, which should work the first time without having to try repeatedly. Got a functioning SIM card laying around? Just plug it into the iPhone and then do the “Start Over” trick as mentioned above, and you should skip right past the “Activation Error” screen and be on your way configuring the iPhone as usual. Using a working SIM card is probably the easiest thing to do and it doesn’t require a handful of Start Over attempts. I’ve read off-hand reports of any original carrier SIM card working for this purpose, but I can’t confirm that, mostly because I don’t have a handful of old SIM cards laying around. But what does work is using a functioning SIM card with the original carrier, whether the phone is locked or not. If you have any difficulties with this approach, be mindful of the SIM card carrier in use. For example, if you successfully unlocked the iPhone from AT&T you might want to try using an AT&T SIM card to “activate” the iPhone initially, and then once the configuration is complete you can switch to the alternate carrier SIM, be it T-Mobile or whatever other carrier you’re attempting to use. This SIM card swap trick has worked for quite a while, particularly for unlocked iPhones that are being used on outside networks. use a valid sim card. worked for me. I stumbled onto a iPhone 5s laying in the bathroom of a Club here in south Africa . but I cannot get my icloud to bypass the original owner and ive tried the 112 calling method by I literally get no were … what do I have to do …??? How about you return the iPhone to the original owner rather than try to “bypass” it yourself? That would be dumb. Who goes to the trouble of returning things they can profit from? Its good karma and the right thing to do! Why steel someones item they saved money to purchase.. and many photos and personal information are on there that they will miss :( Some people…. try a different sim card as the phone could be locked. my phone just stopped working on morning and wouldn’t find the carrier – then they had me do a factory reset and it wouldn’t even activate!!!! my phone now works just fine YAY!!! Ok I’m getting to ticked off because I’ve tried almost every method of doing it and I’m in the Bahamas for vacation so I didn’t bring my computer and I have things to do on my phone so what happened was my sister gave me her phone so I used it but she had so much stuff on it I did restore to original settings and now it’s stuck on the activation presses somebody please help me! I’ve tried so many methods! Thank u it was help full alot !!!!! what if my cellphone is could not be activated because the activation server is temporarily unavailable ,try connecting your iPhone to itunes to activate it, or try again in a couple of times? I had this same problem overseas…..
Just plug in the IMEI numbers into the website search and you find out what carrier your phone is locked to. The FCC requires that by law all parties listed in the complaint respond to you within 30 days and they DO!!!! Sometimes they sing a whole different tune!! otherwise there will be a FCC investigation and they don’t want that. I suggest documenting everything just in case! I do resetting my iphone6 but when the phone installing suddenly is stop so what should I do ? 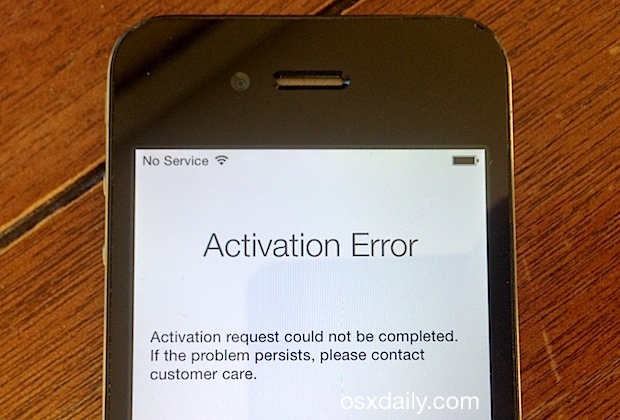 Can iPhone track in the case of Activation Error ???? I found when i disconnected all my devices ( maybe my other phone was the important part) from the wifi connection and only had my new phone connected, i got pat this error…. I am in Papua New Guinea my iphone was factory resented and and It’s giving sim invalid not supported by the carrier..
hi.24 hours ago my iphone 4s supported all kind of sim.but now its not supporting any of them.its all happening after my cousin took my phone for a couple of hours.now if i insert a sim card nothing is happening.requiring an activation but when i activate it through itunes/wifi,nothing is happening.it keep searching,and after some time its sayng again ‘your phone is not activated,contact your career,blah blah blah. Thank you so much! It worked on my iPhone 4! I have a Iphone 5s from Japan (docomo). I dont have a docomo sim whatsoever with me. 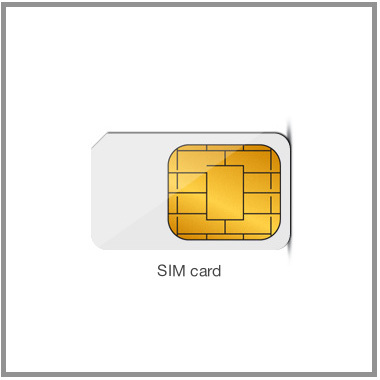 How can i Bypass the activation screen without a sim from docomo? The iPhone is telling you exactly is wrong, it says the SIM card is not supported. It sounds like you bought an iPhone that does not support your SIM card, get a new SIM card or a different iPhone. Thanks Mate. The SIM card option worked ! ! ! Got an iPhone 6s locked to Sprint network in Usa.. I want to make use of the iPhone in Nigeria here please what can I do to be able to use the phone successfully here in Nigeria. 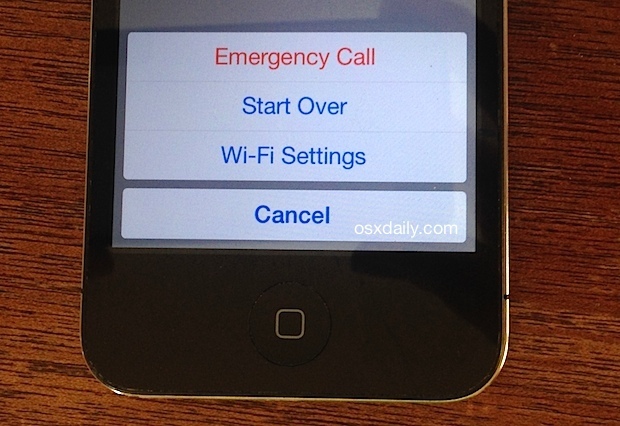 When pressing home screen I do not have an option for “Start Over” only WiFi Settings and Emergency Call. My brandnew iphone had volume key depreseed. 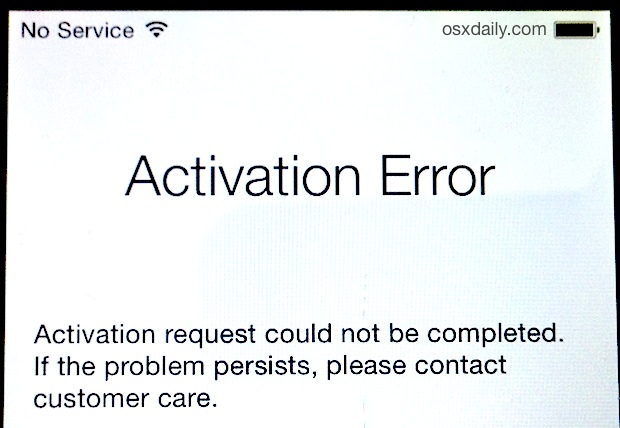 Apple service center in Abu Dhabi got it replaced but after that its giving activation error. Any suggestions? How I fix this, always restart, start over, go to iTunes to update /restore but problem same…. when you count 3 seconds press the middle button too! Keep them both pushed for 10 more seconds. when you count 10 seconds release the lock button and just keep pushing the middle button. A message will appear on the iTunes . Push download and restore and you are ready! 3.Keep the middle button pushed until you get the message on the iTunes . Screen will stay in total Black . Iphone is restarting in restore mode. Good Luck. Hope i helped you guys!!! Thanks very much for the advice…I actually used a non-activated SIM card and it worked fine…must just need a SIM card physically in there. My iphone 5s not activate / Error after update soft and reset..
Any body give me any solution of this error. I had same issue described above and neither working sim or without sim was worked to me. Then I update ios in recovery mode by iTunes then problem was solved.Anyone can try this if faces same issue. Hey, i just bought a 5c but the phone is linked to the old owners account. I asked if they could delete it from there i tunes but the original owner no longer remembers the password. Anyone know how i can finish setting the phone up? I tried the instructions above multiple times already but it’s not working. What will I do?